Right now in Rio de Janeiro the most recent installment of the UN Climate talks are taking place. 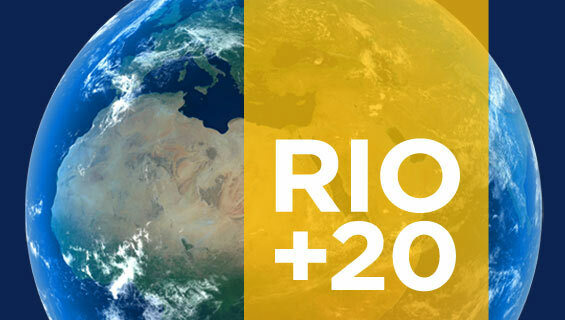 This event, known as Rio+20, is one of many UN Climate talks that have taken place over the past 20 years. It had its official kickoff yesterday. This conference is specifically one of three on sustainable development but, like all other issues that face our climate, the talks bleed into each other. Also like many of the other conferences, this one has opened to sounds of pessimism, division (mainly between developed and developing countries), diminishing promises and frustrations. What seems to happen at these events is a pattern of chest beating from the official representatives - pledges and promises of action, but then a huge cool off when it comes to the actual concessions. Be it fossil fuel subsidies or instances where the U.S. and Europe have tried to delete passages calling on rich nations to move towards "sustainable consumption and production" real traction seems to never really be made on the official levels. These squabbles seem counter intuitive to the various reports showing our fast reaching the environmental tipping point and that we are accelerating towards there. Outside the slow and tortuous negotiations, however, there is a growing realization that issues once discussed as future threats are, decades later, quickly turning into serious current problems, and that the pace of talks to deal with them is not keeping up. >What is rather amazing about these conferences is the efforts that go on behind the scenes by the different stakeholder groups, NGOs and other interested parties. These groups use the importance of these talks to gather for pre-conference meetings and talks of their own in order to share information and pack the most punch for the visiting heads of state and UN representatives. This is a wonderful practice that allows for networking and future action that is more unified and effective in meeting the huge lofting goals that lay ahead of all of us. Over the weekend, those same individuals held an "Oceans day" where attendees gathered to talk about the future of our oceans, coasts and Island States through a very full and diverse schedule. Various groups and leaders gathered to chat specifically about these issues and how to address the common roadblocks to action. Included in this amazing group of intelligent, forward thinking marine enthusiasts are Sylvia Earle, her alliance and the Global Foundation for Democracy and Development. Together they presented, “Oceans in Google Earth as an Educational Tool: A Dominican Republic Perspective” where they showed the Ocean layer in Google Earth and how it s a powerful tool for ocean education and awareness. Today, the Rio+20 Oceans Dialogue were opened by Philippe Cousteau, grandson of famed ocean explorer Jacques Cousteau, moderator of a panel of 10 international ocean experts. On the stage next to them were 10 critical recommendations on "advanc[ing] global ocean management. Many different startling issues were discussed; rising sea levels threatening island and coastal communities, food supply, biodiversity, ocean acidification and the resulting loss of animal life and O2, and even the same rising issues that we have been noticing for the past 6 years. When facing such serious and detrimental threats it is easy to focus on the seemingly futile effort and frame it in a negative and horrifying way. Personally, I have grown tired of the depressed mood that seems to be going around. It is surprisingly uplifting to see events and efforts like these with such promise and positivity. It seems that people out there are tired of fear tactics and negative language, hope and an attitude of "yes we can" still ring true. Below is a stunning example from the Pew Charitable Trusts and the Zoological Society of London. The official kickoff of the Climate talks coincided with another amazing and positive campaign that was spearheaded and conceived by 350.org; a climate change action group. The goal was to raise awareness of the amount of money spent on fossil fuel subsidies and the need to divest from that practice through a "twitter storm." The request to post tweets with the hashtag; #EndFossilFuelSubsidies with various messages supporting a change away from climate-harmful investment practices. The request was answered by a slew of celebrities and tons of individuals through out the world causing the hashtag to be one of the top trenders in the world (number one or two in the United States depending on who you ask). In fact, as pointed out by Duncan Clark of the Guardian, this effort was, "...timed to put pressure on world leaders attending the Rio+20 conference to live up to their earlier commitments to stop using money government money to support fossil fuel production or consumption. Pressure will certainly be needed, as the current draft of the Rio text doesn't mention oil, coal or gas subsidies." Some may consider this effort a marginal "victory" because of the fact that the ultimate goal of reaching the Climate Talks delegates doesn't seem to be working as effectively as hoped. These arguments forget the significance of awareness, reach and participation. It was astonishing to see such action on this issue in the twitter verse and the media's reaction to it. The fact that these tweets breached the virtual/real world gap by being projected on the Sydney Opera House and other sites in London, New York, New Delhi and Rio speaks volumes not to mention the fact that this was an effort by non-profits and NGOs to allow the public a greater voice at talks like these, where their voices have traditionally been filtered by third parties or even obfuscated by other concerns. This is a trend that needs to continue and increase, exponentially. As argued before, it seems that the stakeholders, NGO's and individual citizens are grabbing a larger share of the powers that allow them to shape the future, hopefully combatting those forces that think only of power and money. Good luck RIO+20, let us come together positively and make the future we want.